The debate has already begun as Major League Baseball has instituted a new rule to help cut down on home plate collisions and help prevent major injuries. This has already been about as hotly debated as any of the other changes baseball has added to the game over the past few years(replay, extra wild card, etc.). One of the main things discussed has been how MLB didn’t go far enough with the rule, or enough to protect the baserunner in these situations. Let’s dissect the rule. I’m not going to get into how Posey didn’t get himself set up well, which I feel like made this play even worse than it should have been. Scott Cousins of the Marlins caught a lot of flak for plowing into Posey here, and you can look at this one of two ways. One, Posey was blocking the plate, making it hard for Cousins to go around him. Or two, that Cousins could have slid around him, taking the possibility of an injury out of the equation. Watching the footage a number of times again, I can see both arguments. Look, if the catcher is blocking the plate, it takes away one of the options for the runner. I don’t think Cousins ran into Posey to hurt him; that was just instinct to get to home plate and score. Now, Cousins could have possibly went around him and attempted to slide. Posey had set up in front of the dish to where Cousins had some room to get around him. But part of this issue is instinct. For years baserunners have been told that if the catcher is blocking the plate, lower your shoulder and barrel in. You can’t blame a runner for this; he is going in there with no extra equipment on while the guy he is set to run into has a full set of body armor on. I am all for cutting back on injuries and especially for curbing someone from getting a concussion. But with the way the rule is set up now, you are asking for more injuries. Bruce Jenkins takes a good look at this, discussing how players seem to be more open to injuries than before. Many of these guys don’t think about it before they head to home plate; they don’t think, they react. What do you think will happen now? There is a good chance many players will start thinking about it, and force them to either injure themselves or the catcher(or both). Do we want this to happen? Of course not, but putting the rule into play right before Spring Training leaves very little room to really practice for this situation. But let’s stay that teams work on the play religiously this spring and everyone feels like they are set and ready in case they are thrown into that situation. If you are the runner, this doesn’t seem like this new rule will benefit you. • A runner may not run out of a direct line to the plate in order to initiate contact with the catcher, or any player, covering the plate. If he does, the umpire can call him out even if the player taking the throw loses possession of the ball. • The catcher may not block the pathway of a runner attempting to score unless he has possession of the ball. 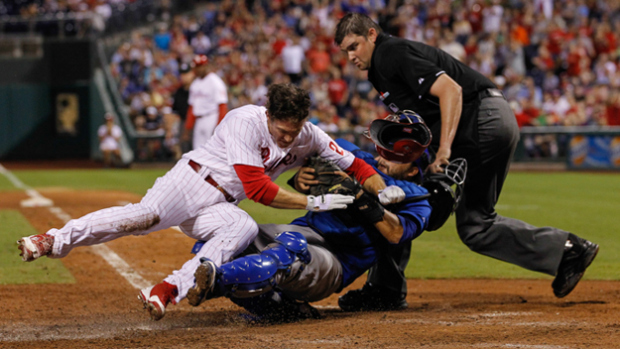 If the catcher blocks the runner before he has the ball, the umpire may call the runner safe. • All calls will be based on the umpire’s judgment. The umpire will consider such factors as whether the runner made an effort to touch the plate and whether he lowered his shoulder or used his hands, elbows or arms when approaching the catcher. 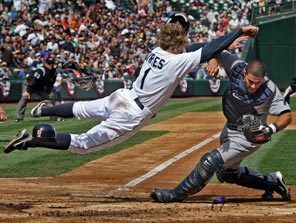 • Runners are not required to slide, and catchers in possession of the ball are allowed to block the plate. However, runners who do slide and catchers who provide the runner with a lane will never be found in violation of the rule. • The expanded instant replay rules, which also go into effect this season, will be available to review potential violations of Rule 7.13. So leaving the rule open to allowing the catcher to still block the plate while not wanting the runner to defend himself seems like a recipe for disaster. It is very apparent that if they were smart, most teams would go to the swipe tag at home plate. The Giants have already taken that route, putting that into play once Posey returned to action. This is probably where it is headed anyway, so why not go ahead and enforce it, rather than use the new rule as an “experiment”? This doesn’t seem like a play you want to “dip your toes into the water” to test the temperature. Above you see maybe the most famous home plate collision in baseball history. 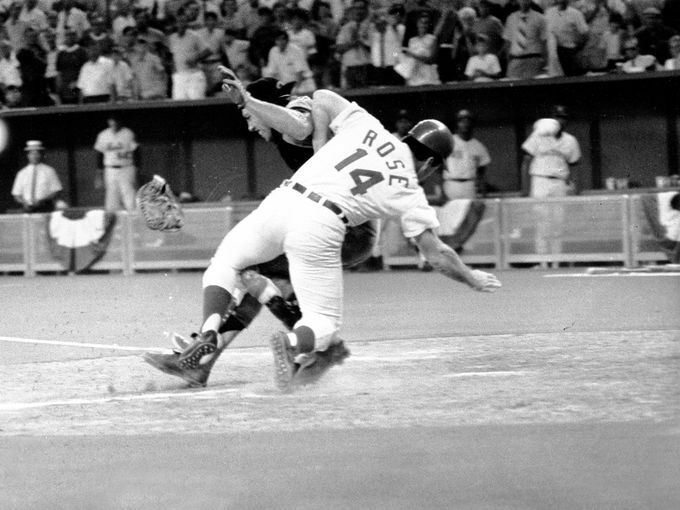 In the 1970 All-Star game, Ray Fosse blocked home plate while Pete Rose barreled into him. Fosse was injured by this collision, an injury which wouldn’t be noticed until the following year and was forced to heal incorrectly. Fosse would continue to play throughout the 70’s but was never the player he was before ‘Charlie Hustle’ ran him over. Fosse is proof of what home plate collisions can do to your career. The point of the new rule is to protect players from injuries, but it brings up more questions than answers. There is a feeling that the rule was kind of thrown together and a rule focused on catchers not blocking the plate would seem to be the direction they will eventually go. They already do that in the college game, so for most players drafted from this point forward it wouldn’t be a drastic change. The main thing that needs to happen is for a rule to be instituted that protects both catcher and baserunner. Concussions are a serious matter and baseball is moving in the right direction to remedy the problem. The sooner they eliminate the catcher blocking the plate, the better. It’s the best thing for the game.